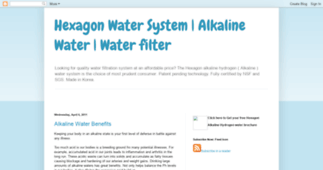 According to the data and stats that were collected, 'Hexagon Water System | Alkaline Water | Water filter' channel has a mediocre rank. The feed was last updated more than a year ago. The channel mostly uses long articles along with sentence constructions of the advanced readability level, which is a result that may indicate difficult texts on the channel, probably due to a big amount of industrial or scientific terms.